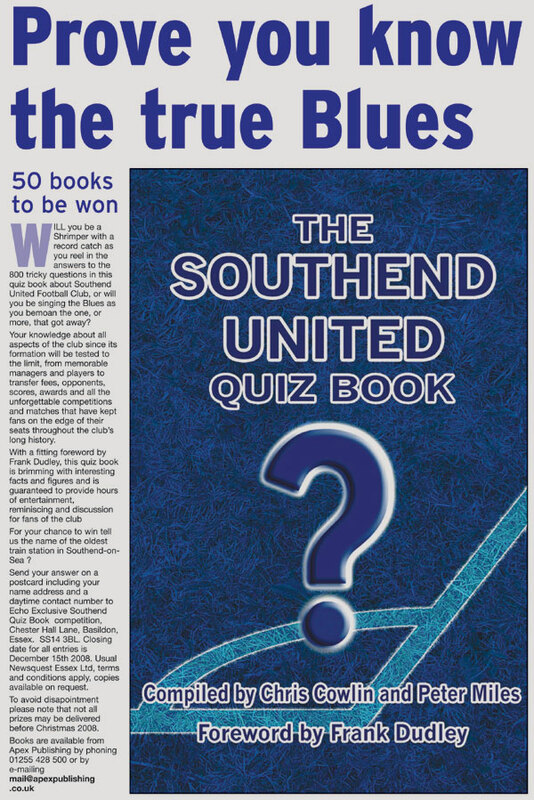 Brief Description: Will you be a Shrimper with a record catch as you reel in the answers to the 800 tricky questions in this quiz book about Southend United Football Club, or will you be singing the Blues as you bemoan the one, or more, that got away? Your knowledge about all aspects of the club since its formation will be tested to the limit, from memorable managers and players to transfer fees, opponents, scores, awards and all the unforgettable competitions and matches that have kept fans on the edge of their seats throughout the club’s long history. With a fitting foreword by Frank Dudley, this quiz book is brimming with interesting facts and figures and is guaranteed to provide hours of entertainment, reminiscing and discussion for fans of the club. Peter Miles: This is Peter Miles' ninth published football book and his fifth on Southend United, a club he has supported home and away for more than thirty years. 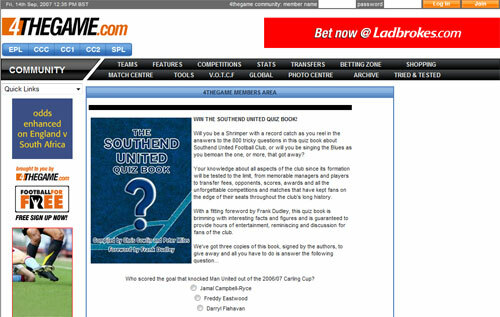 This book will keep you guessing for hours, a must for all Southend United fans. A very interesting book. I thought I knew a bit about Southend United! A must for all Southend supporters. 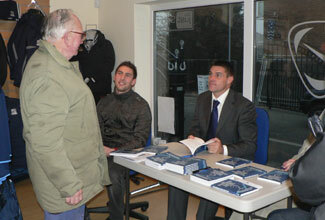 (Photo: Dean Austin (right) reading a copy of 'The Southend United Quiz Book'). Have as much fun with this book as I did with the Shrimpers! This book brought back so many great memories of the club. A true gem - every Southend fan will enjoy this book. I will be taking the opportunity on our next away trip to test the boys on just how much they know about the club. Some of the questions certainly caught me out, a great read. 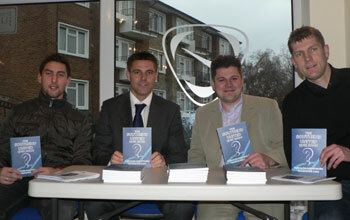 (Photo: Che Wilson (left) with a copy of 'The Southend United Quiz Book'). A well researched book, when I picked this book up and read some questions I learnt some much about the club and I thought I knew a lot of the Shrimpers. This book will be great fun for any fan. 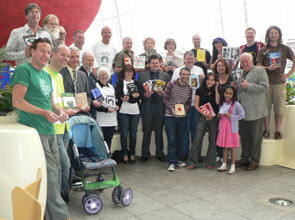 (Photo: Steve Tilson (left) with a copy of 'The Southend United Quiz Book'). You often see the phrase ‘a must for any self respecting supporter’ but this time the phrase is well placed as this book is a MUST! I am often approached by supporters with the opening statement that they have been a supporter for 35 or 45 years and do recite events the club that happened years ago. This is just the book for them! I am sure that the Shrimpers Trust will use it extensively at their quiz nights! A great test for any Shrimpers fan. Many interesting and diverse questions covering all aspects of Southend United, and to suit all abilities. I can always remember my early playing days, I had always played football as a youngster with the Air Training Corps and somebody must have seen me playing and arranged for me to have two or three games with Southend United reserves, which I did. I thought I played terribly but they must have seen something because within a month they asked me to sign as a professional. That was in 1945 and I was on seven pounds a week, and another pound or two pounds if I played in the first team. I remember my first team debut clearly, it was at the old Southend Greyhound track, the Stadium as they called it. To my amazement, the manager Harry Warren had called me in and said "I am playing you against Watford on Saturday" and he put me in. I was very nervous especially as I remember walking onto the field, and this old chap from Watford who was alongside me and was about ten years older than me. He said I understand that this is your first game. I said yes it was, he said "well you see that grandstand over there", I said yes, but he said "well if you come anywhere near me this afternoon I will kick you right over the top". I thought what have I let myself in for? Again personally I thought I had a terrible game but after a while I started to score goals and I never really looked back. I had a wonderful time at Southend and played with some great players and friends but the best was the then captain Jimmy McAlinden, an Irish international and a very, very good player. I later had a good career with Leeds, Southampton, Cardiff City and Brentford before returning to Southend and a lengthy spell working in local government. I remain a big Blues supporter and the club are very good to me, I have a permanent seat at Roots Hall which they allocate to me each year. I am so pleased to see them doing so well and I know for a fact that the present manager knows a bit about football and I think he is the best thing that has happened to them in years. 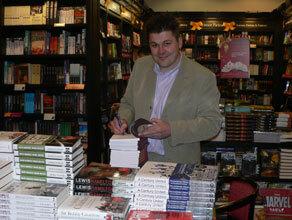 I am thrilled to write the foreword for this book and hope you will enjoy it! I am sure all Shrimpers fans will find this book very testing and it will also help to revive one or two memories I am sure. Up the Blues! 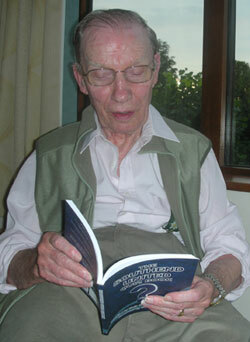 (Photo: Frank Dudley with a copy of 'The Southend United Quiz Book'). 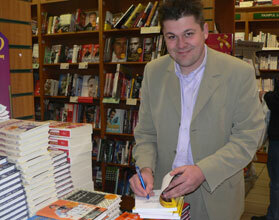 A book to turn Blues fans pink with pleasure... weeks of happiness lie ahead for them! There is very little literature available for Southend United fans to get their teeth into, so when something new comes along, you have to gobble it up as quickly as you can. 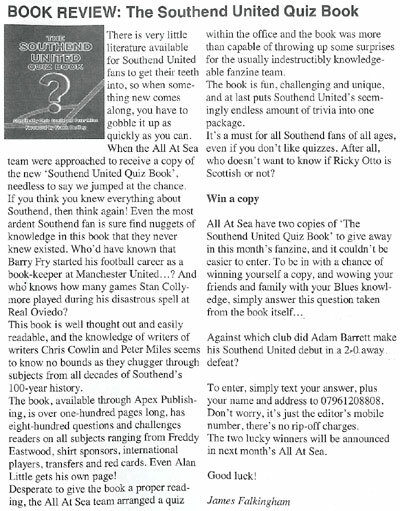 When the All At Sea team were approached to receive a copy of the new ‘Southend United Quiz Book’, needless to say we jumped at the chance. 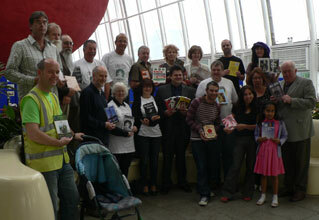 If you think you knew everything about Southend, then think again! 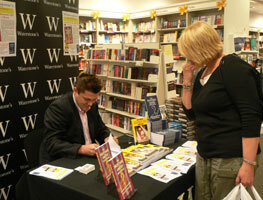 Even the most ardent Southend fan is sure find nuggets of knowledge in this book that they never knew existed. Who’d have known that Barry Fry started his football career as a book-keeper at Manchester United…? 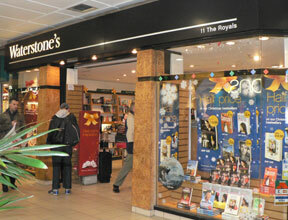 And who knows how many games Stan Collymore played during his disastrous spell at Real Oviedo…? This book is well thought out and easily readable, and the knowledge of writers of writers Chris Cowlin and Peter Miles seems to know no bounds as they chugger through subjects from all decades of Southend’s 100-year history. 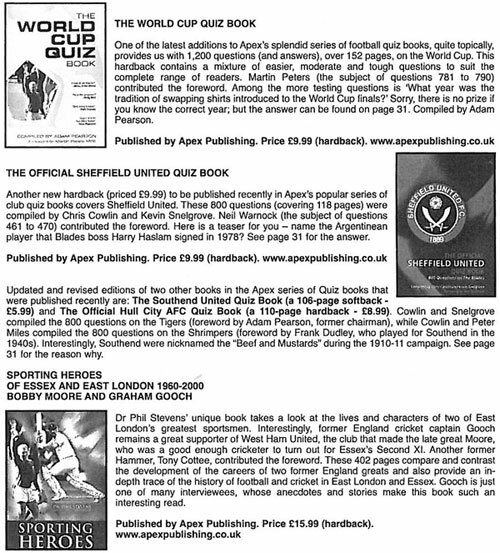 The book, available through Apex Publishing, is over one-hundred pages long, has eight-hundred questions and challenges readers on all subjects ranging from Freddy Eastwood, shirt sponsors, international players, transfers and red cards. Even Alan Little gets his own page! 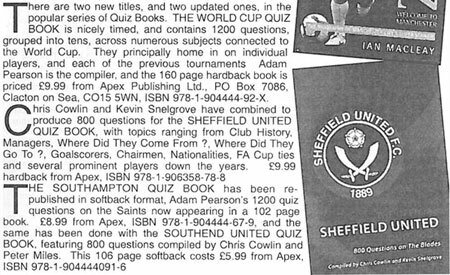 Desperate to give the book a proper reading, the All At Sea team arranged a quiz within the office and the book was more than capable of throwing up some surprises for the usually indestructibly knowledgeable fanzine team. The book is fun, challenging and unique, and at last puts Southend United’s seemingly endless amount of trivia into one package. Against which club did Adam Barrett make his Southend United debut in a 2-0 away defeat…? To enter, simply text your answer, plus your name and address to 07961208808. Don’t worry, it’s just the editor’s mobile number, there’s no rip-off charges. The two lucky winners will be announced in next month’s All At Sea. 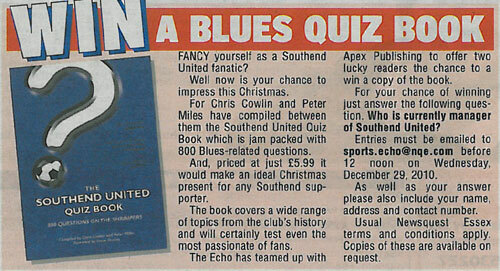 The highs and lows of the Shrimpers are captured between the pages of 'The Southend United Quiz Book'. 800 questions to tax the knowledge of even the most ardent Blues fan. This book's a real winner! 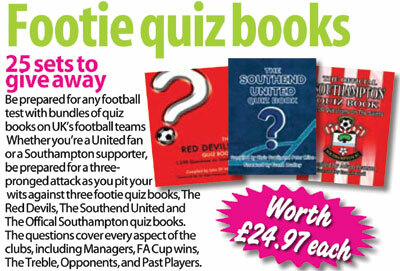 This quiz book is another fine example in an excellent series that will delight not just Shrimpers supporters. 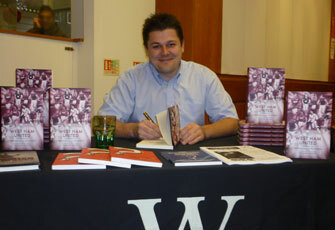 This book covers all aspects of the club, from the players to the history of the club. It will provide a great fun and a challenge for even the most loyal Southend United fan. The compilers Chris Cowlin and Peter Miles have done their homework well - an informative read packed with facts & trivia. A must for any Southend United fan! 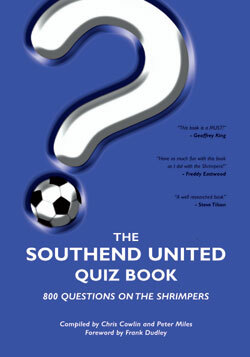 Well now is time to prove your knowledge with the release of the club's quiz book which includes 800 questions on the Shrimpers. Both past and present events are covered, alongside memorable matches and legendary players. The book, which includes a foreword from former Blues player Frank Dudley, is 112 pages long and is available for just £5.99. 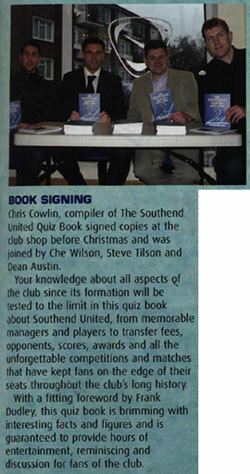 It was compiled by Chris Cowlin and Peter Miles and they are hoping it will prove popular among Southend's supporters. 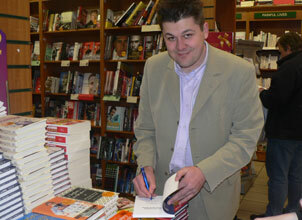 "I really hope that everyone will enjoy this book," said Cowlin. "I'm sure it will bring back some wonderful memories for everyone and it has been an honour to join forces with Peter to do the book. 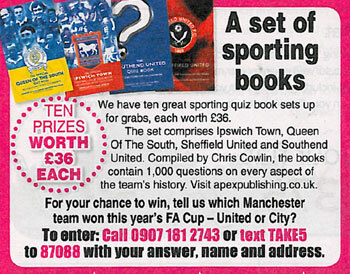 The quiz book would certainly help pass the time during the long away trips this season and is a must for all Shrimpers fans. 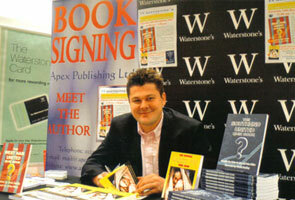 It is available now and is published by Apex Publishing, ISBN number 1-904444-91-1. How well do you know the boys from Roots Hall? 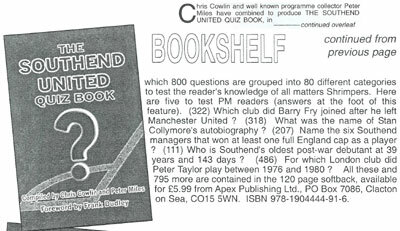 From Chris Powell to Brett Angell, The Southend United Quiz Book will test the knowledge of the biggest Shrimper! 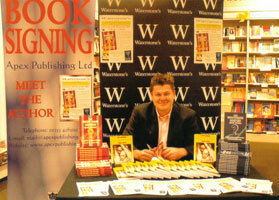 24 February 2010 - Chris Cowlin was interviewed on BBC Radio Essex 103.5 & 95.3 FM. 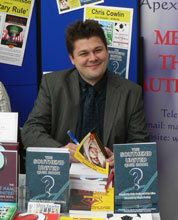 Chris answered questions about his book 'The Southend United Quiz Book' on 'The Ray Clark Show'. 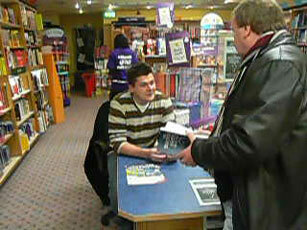 13 March 2010 - Peter Miles was interviewed on BBC Radio Essex 103.5 & 95.3 FM. 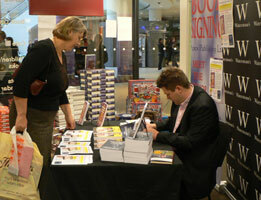 Peter answered questions about his book 'The Southend United Quiz Book'. 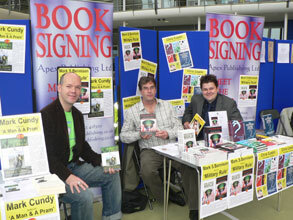 3 copies were given away in a competition on 'The Glenn Speller Show'. 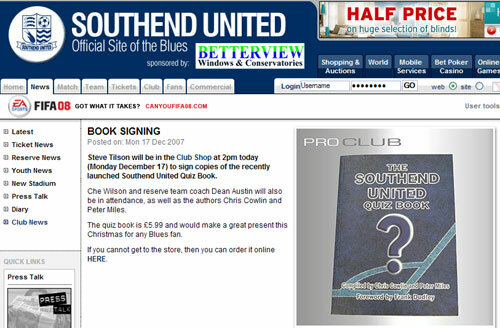 If you think you know everything about Southend United - think again! It's the quiz of the century. 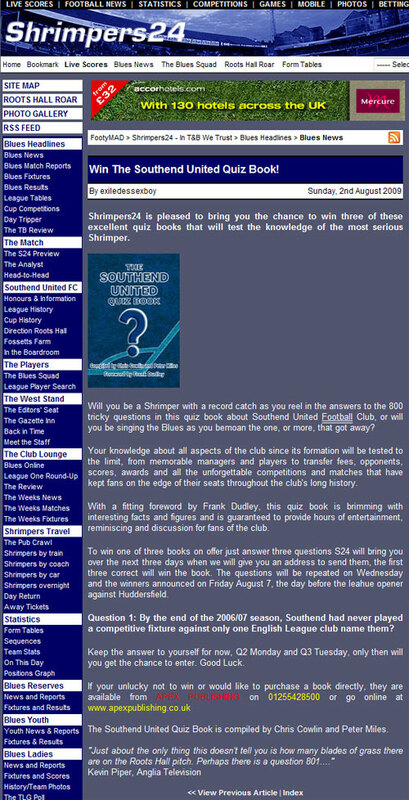 The ultimate anorakopedia of Southend United... a machine gun firing questions and answers. There's enough trivia here to while away the miles on those long away trips... and you'll never have to phone a friend. Having read Chris Cowlin's other quiz books I knew to expect a thoroughly researched and detailled book - and I certainly wasn't disappointed. Chris is certainly top of the league when it comes to football trivia! Call yourself a Shrimpers fan? How much do you really know? This cracking compilation will have you answering questions on the team's early days, famous players and managers, golden moments and gifted goalies. 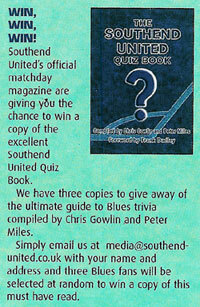 Test your knowledge to the limit with 'The Southend United Quiz Book'. Excellent! Floored many so called United fans who thought they knew it all. I am a non-footballing wife but enjoyed being the quiz master! A very good fact based book about Southend United. 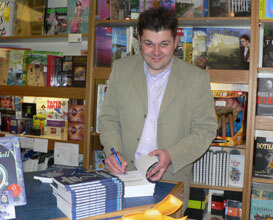 Chris Cowlin signed copies of 'The Southend United Quiz Book' at Waterstone's, High Street, Southend. 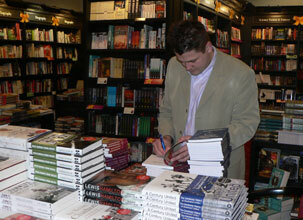 Chris Cowlin signed copies of 'The Southend United Quiz Book' at Waterstone's, Lakeside. 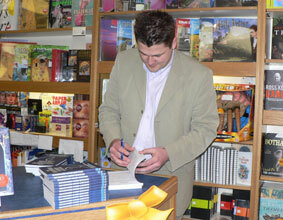 Chris Cowlin signed copies of 'The Southend United Quiz Book' at Southend United Club Shop, Roots Hall, Southend. Chris was joined by current manager Steve Tilson, defender Che Wilson and former player Dean Austin. 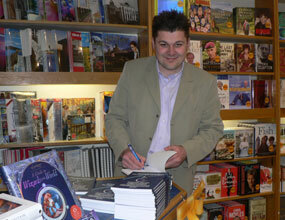 Chris Cowlin signed copies of 'The Southend United Quiz Book' at Waterstone's (The Royals), Southend on Sea. 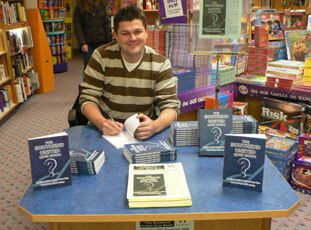 Chris Cowlin signed copies of 'The Southend United Quiz Book' at Waterstone's, Basildon. 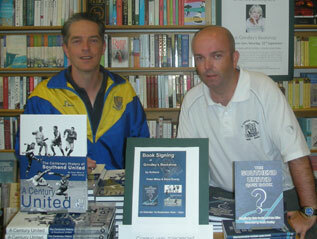 Peter Miles signed copies of his book 'The Southend United Quiz Book' at Grindley's Bookshop, Leigh on Sea. 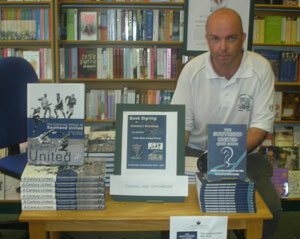 (Photo 1: Peter at Grindley's Bookshop, Photo 2: Peter (Right) with Dave Goody (left), author of various Southend United titles). 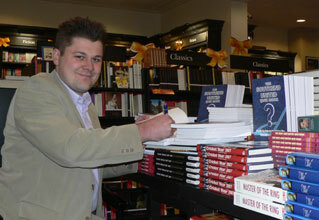 Chris Cowlin signed copies of his book 'The Southend United Quiz Book' at Waterstone's (The Royals), Southend on Sea.